I’ve had my eye on Darkborn for a while; it sounds like such an interesting concept. Two races living in the same city, but one dies from the sun and the other dies from darkness? Cool idea. In the city of Minhorne, Darkborn and Lightborn live side by side, never meeting, divided by a powerful mages’ curse that makes daylight lethal to the Darkborn and darkness lethal to the Lightborn. They are divided, too, by their acceptance of magic and technology, their politics, their religion, and their views of the proper conduct of men and women. An act of necessary succor brings Darkborn physician Balthasar Hearne to the deadly attention of agents of a new and unrecognized enemy of both Darkborn and Lightborn. His aristocratic wife, Telmaine, is forced to use magical abilities she has all her life concealed, to protect her husband and her children. And Ishmael di Studier, mage and outcast, who has spent his life defending his borders home from the marauding Shadowborn, now finds himself engaged against an even more dangerous enemy. 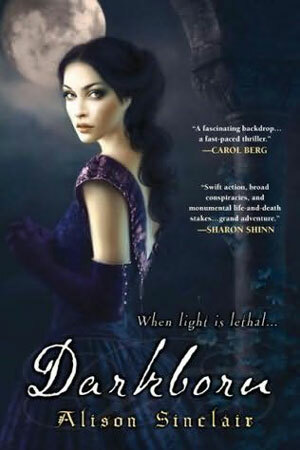 Darkborn by Alison Sinclair is available on Amazon.co.uk for £5.39 and on Amazon.com for $6.99.